Make a decorative wall scratcher for your cat! Cut two wood boards to the length needed for the scratcher and cut one end of each board on an angle. Drill a hole through the flat end of the boards, use wood glue to attach the boards and hold the boards together with a clamp while the glue dries. Glue the end of a piece of sisal rope to the back of the board, tightly wrap the remaining rope around the board and add glue beneath each front row of the rope. Cut several small piece of colored ribbon and tie the decorative ribbon around the scratcher at various locations. 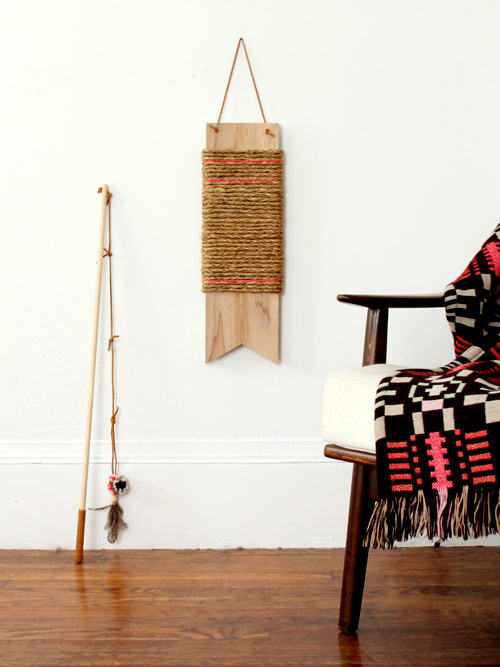 Cut a piece of leather string or rope, knot the rope to the holes in the boards and hang the cat wall scratcher.